A computer beats the reigning human champion of Go, a game harder than chess. Another is composing classical music. Labs are creating life-forms from synthetic DNA. A doctor designs an artificial trachea, uses a 3D printer to produce it, and implants it and saves a child’s life. Wadhwa offers us three questions to ask about every emerging technology: Does it have the potential to benefit everyone equally? What are its risks and rewards? And does it promote autonomy or dependence? Looking at a broad array of advances in this light, he emphasizes that the future is up to us to create—that even if our hands are not on the wheel, we will decide the driverless car’s destination. Vivek Wadhwa is a Distinguished Fellow at Carnegie Mellon University’s College of Engineering and a director of research at Duke University’s Pratt School of Engineering. He is a globally syndicated columnist for the Washington Post; author of The Immigrant Exodus, which the Economist named a Book of the Year of 2012; and coauthor of Innovating Women, which documents the struggles and triumphs of women in technology. Wadhwa has held appointments at Stanford Law School, Harvard Law School, UC Berkeley, and Emory University and is an adjunct faculty member at Singularity University. Alex Salkever is vice president of marketing communications at Mozilla. He was a technology editor of BusinessWeek, a regular science contributor to the Christian Science Monitor, and a contributor to The Immigrant Exodus. "Writing with Alex Salkever, Wadhwa ranges over applications from genome editing and the Internet of Things to artificial intelligence, weighing up their potential for risk and the universality of any benefits. Readers may not all share his enthusiasm for autonomous vehicles, but his pointed analyses of the coming transformations add nuance to the debate." "I strongly recommend this well-written book. You would be hard put to find another review of technological advance that covers so much ground so succinctly — and at times so provocatively." 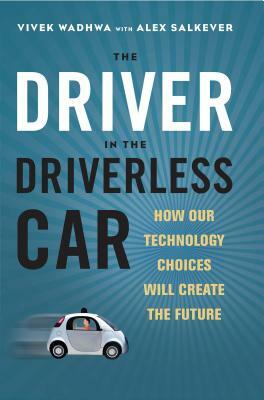 "Of all the books I have read so far this year, &apos;The Driver in the Driverless Car – How our technology choices will create the future&apos; by American technology guru Vivek Wadhwa and tech journalist Alex Salkever impressed me the most."